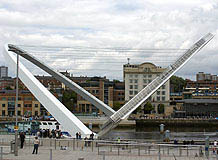 Gateshead Millennium Bridge is one of several linked regeneration projects along 'Gateshead Quays', and plays the essential role of linking this area accessibly to the center of Newcastle. It is a tilting bridge, but in a completely original and elegant manner. The pedestrian and cycle pathway is an almost-horizontal curve, suspended above the river from a just-beyond-the-vertical parabolic arch. To raise the bridge, this whole assemble rotates as a single, rigid structure. As the arch tilts lower, the pathway rises, each counterbalancing the other so that a minimum of energy is needed. The simplicity of the idea, and the geometry of the curves at each stage of the bridge's move (and in its rest state) are superbly elegant. 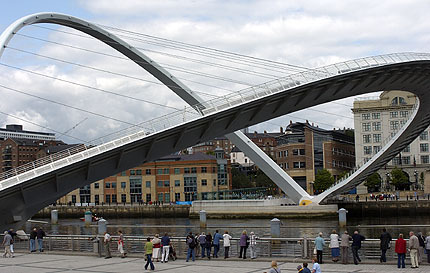 The bridge won the Royal Institute of British Architects' Stirling Prize in 2002. It has also proved a popular icon locally, and appears to be well used recreationally despite a slight but noticeable degree of wobble in the middle of the span. 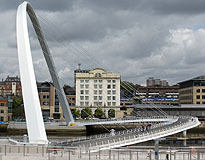 The Gateshead Millennium Bridge takes its place at the end of a line of distinguished bridges across the Tyne, including the Tyne Bridge and Robert Stephenson's High Level Bridge, which can be seen well from the new bridge. It's a demanding position, which this bridge well deserves. If there is one quibble, it is with the posts and rods in the river that guide shipping towards the center of the channel where the curve of the raised bridge gives the maximum height. It is the bridge's design that requires these guide posts, but they show no sign of having been anticipated or treated as part of the esthetic design of the structure, which is a pity. 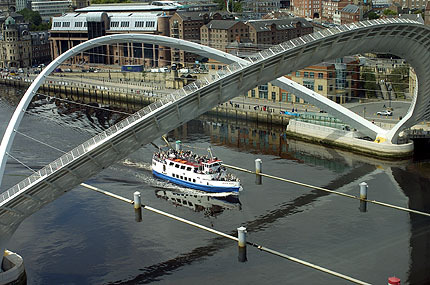 The bridge connects Gateshead's South Shore Road with Newcastle's Quayside. The nearest Metro stop is Manors (though Monument is only a short walk). The bridge opens at pre-announced times as well as in response to shipping needs at other times. Opening times may vary by week; check for times and other visitor information at www.gateshead.gov.uk. 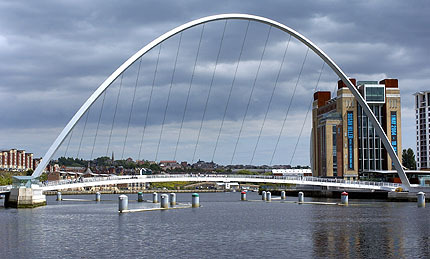 You may also be interested to visit Foster and Partners' The Sage at the Gateshead end of the bridge.